Apparently the Emerald version specializes in speed. 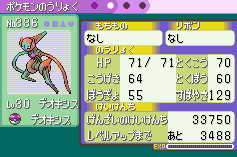 The 33750 EXP, given Deoxys' growth schedule, pins it down as level 30. The other pictures show a L70 specimen with 150 HP (again adjusted to the equivalent of 75 in any other stat). Any other information in that picture that could help determine what the base stats might be?